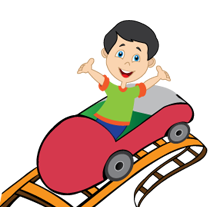 Get hooked and discover a home to NJ's most awesome array of amusement rides and attractions, Bowcraft is NJ's Family Amusement Park has an emphasis on kiddie rides and family rides. Children and adults will have a blast while you make memories that last forever and bring families closer. Comes with a large selection of rides for children and teens. Rides include the Dragon roller coaster and the brand new Crossbow Roller coaster. Other attractions includes, The Drop Zone, Crazy Submarine, Galleon Pirate Ship, Frog Hopper, and Scrambler just to name a few. We also have old favorites as The Merry Go Round, Train, Bumper Cars, and Tilt-A-Whirl. Make a day with Bowcraft!